Why a pedigree is so important. 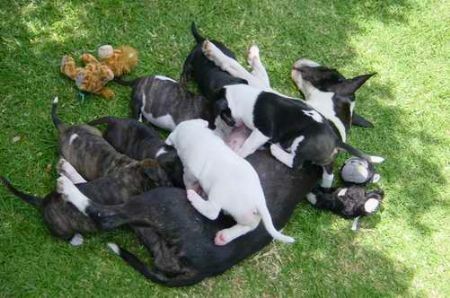 The North Island Bull Terrier Club is for Bull Terrier and Bull Terrier (Miniature) enthusiasts in New Zealand. This is a vibrant club for owners, intending owners and fans of pedigree and purebred examples of our breed. The club is committed to the preservation of the bull terrier. Our sphere of influence is the North Island of New Zealand but we welcome members from the world over. We intend for this site to help provide useful information for owners and prospective owners whether they are interested in owning a bull terrier for companionship through to those owners who wish to show their bully and breed from it. We also have information on all of the activities you can enjoy with your bull terriers that are promoted by the club and this will be found on our Upcoming Events Page. The Club promotes the breeding of pedigree bull terriers that conform to the breed standard and conformation showing. We hope you enjoy the site and find it useful for answering your questions about bull terriers, the club, and our activities. Please note this site is a work in progress and we endeavour to keep all pages and relevant information up to date.